Left the Abominable Snowmansion very early in the morning--first one up as usual. Drove through the Carson National Forest to get here. Still snow on the ground. The Durango Hostel is nothing fancy, but it's not bad. Got everything I need. There are two other hostellers here. Durango, Colorado is surrounded by mountains. There'll be a cool breeze tonight. Took a walk around the city. Had dinner at a restaurant. I'll be up early tomorrow. I want to see Mesa Verde and Four Corners before going to the hostel in Page, Arizona (near Lake Powell). I just received an e-mail from Candace Lemon. She informed me that the old Durango Hostel closed down in 2002. And that she is the manager of the new hostel: Durango Hometown Hostel. I received another e-mail from the Durango Hostel. 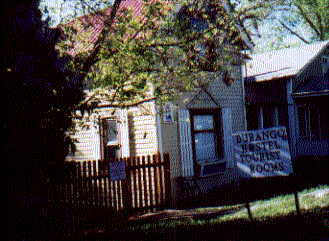 I have not been to the new Durango Hostel. If you want to see what it is like now, then check out their website above. Photo & prices based on what they were during my 2001 road trip. I'm sure most or all of the hostels that I stayed in a decade ago have changed. 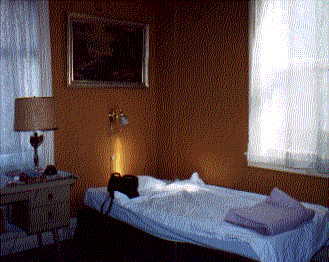 But this website is only about my experiences during my 2001 road trip and the places I stayed. If anyone is looking for CURRENT information about hostels, it is probably best to go directly to their web sites.